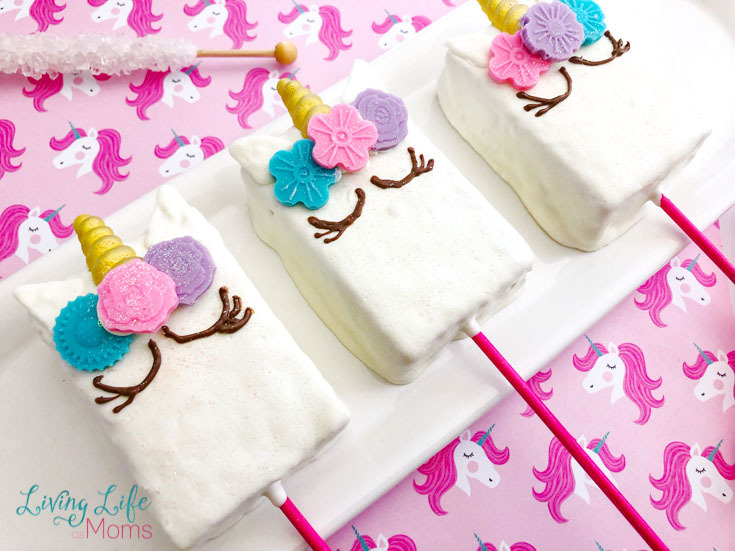 These Unicorn Rice Krispies Treats are almost too adorable to eat. ALMOST. Once you taste them, you’ll quickly fall in love with their taste! There’s just something awesome about Rice Krispy treats. Kids love them, adults love them and there aren’t many people who will turn them down. They’re just an all-around delicious treat. But when you take them and make them look like unicorns…it takes them to a whole other level. While these Rice Krispies treats are beautiful, they’re actually even more delicious! 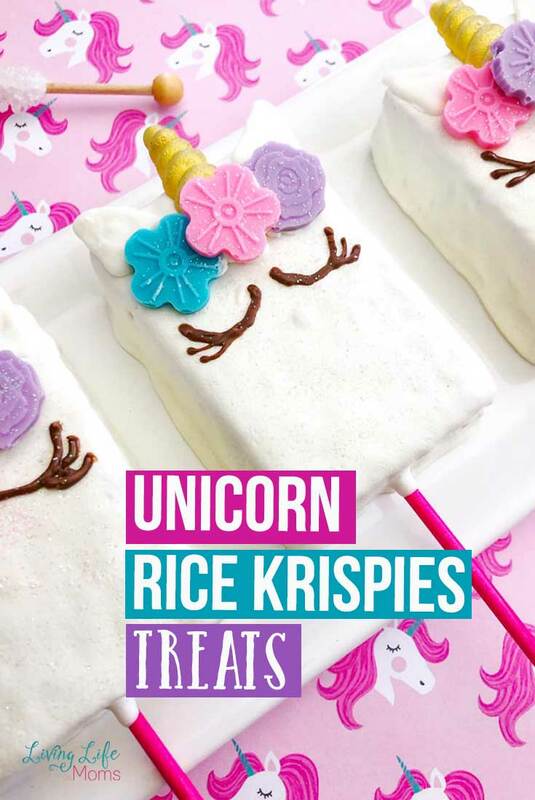 See for yourself and make your very own Unicorn Rice Krispies treats! 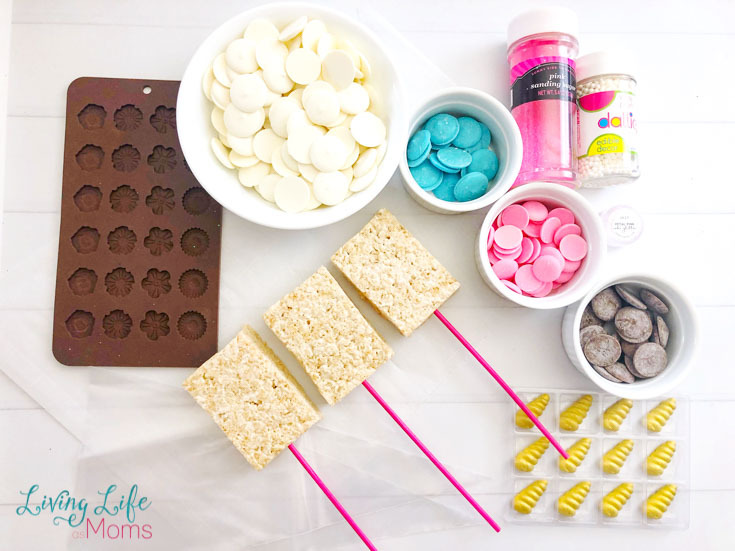 Making Rice Krispies treats is always fun, but getting to add in cool colors and fun molds make these a really, really fun cooking activity. Start by gathering up all your ingredients before you get started. 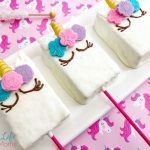 This recipe is used with store bought Rice Krispies treats to keep it simple and save time, which is always a winning combination. Not only does it save time to get store bought Rice Krispies, but it keeps them all the same size as well! No one wants to feel as though they got a smaller Unicorn Rice Krispies Treat than someone else, right? Eliminate the issue by buying them at the store. Problem solved. After you’ve dipped them in your melted white chocolate, it’s time to get creative! 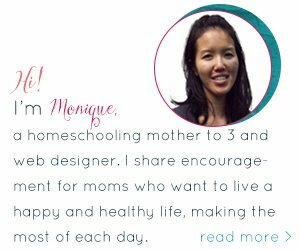 Don’t pressure yourself here on making everything perfect. Just have fun. And if you are making these with family or friends, it’s actually a lot of fun to see how everyone’s varied once they are done. No two will be exactly the same! 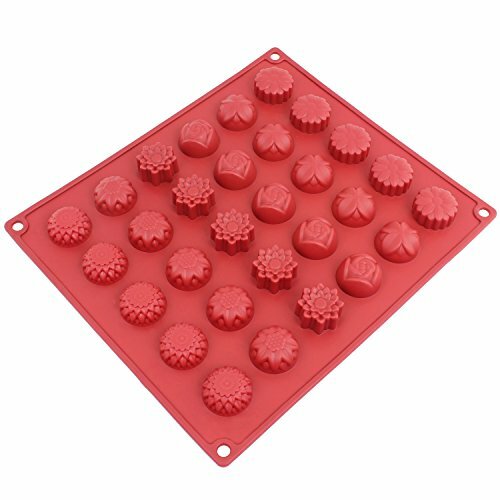 Don’t forget your molds! 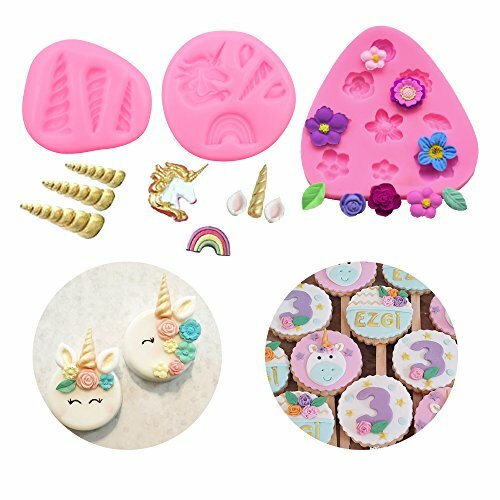 The molds are what makes the beautiful flowers that decorate the foreheads of your “unicorn” so these are supposed to be bright and festive colors. 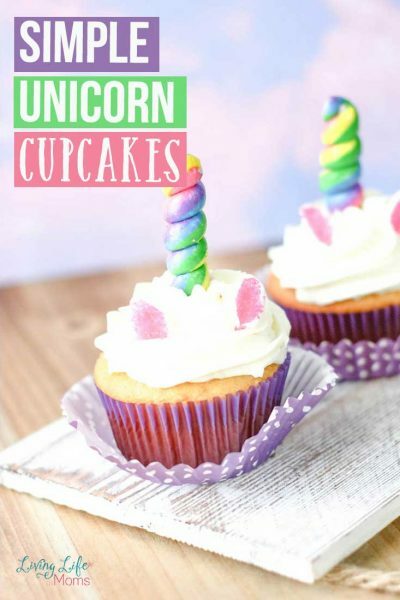 Don’t worry, you don’t have to be an artist or cake decorator to make these unicorn desserts. 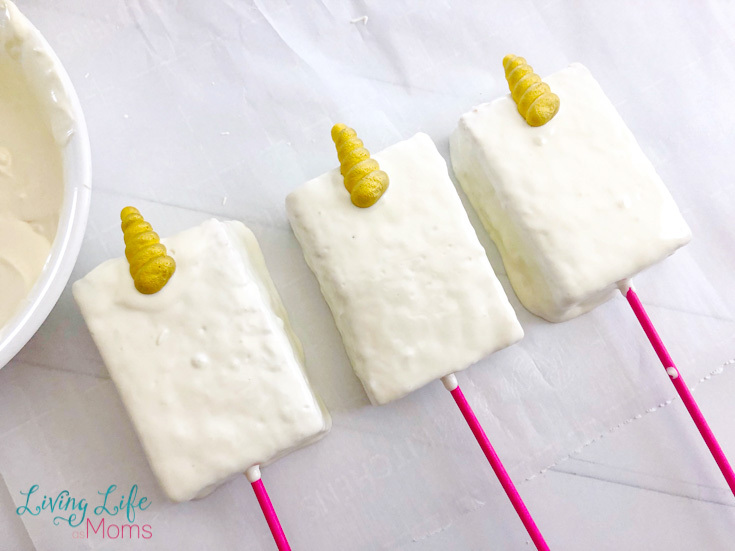 As long as you have a positive attitude and mentally, your unicorn treat will come out looking amazing! See how pretty the flowers look? You can vary up the colors that you use for each mold which gives each unicorn treat a varied and different look. They’re almost too cute to eat. ALMOST. Once they’re done, enjoy what was created and take a big bite! Grease a small 9x13” pan with a nonstick cooking spray. In a large microwave-safe bowl, heat the marshmallows with 3 tablespoons of butter for 1-2 minutes until the marshmallows get puffy and the butter is melted. Scoop the mixture into your baking pan, pressing down firmly with a greased potato masher and freeze for 15 minutes. 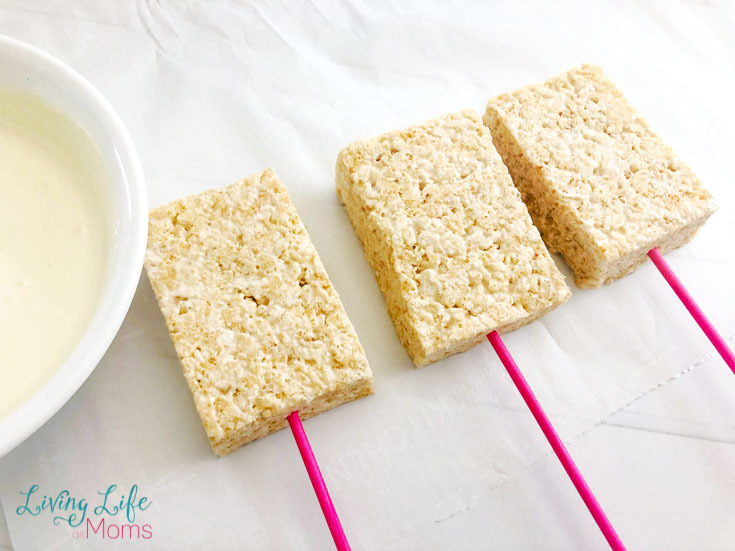 Cut your Rice Krispies into rectangles and place a lollipop stick into the center of one of the shorter sides of the Rice Krispies. Heat the white candy melts on 50% power for 3-4 minutes on 50% power, stirring every 30 seconds until melted. Lay out a piece of parchment paper and coat the top and sides of each Rice Krispie in white chocolate using a spoon and holding the stick. 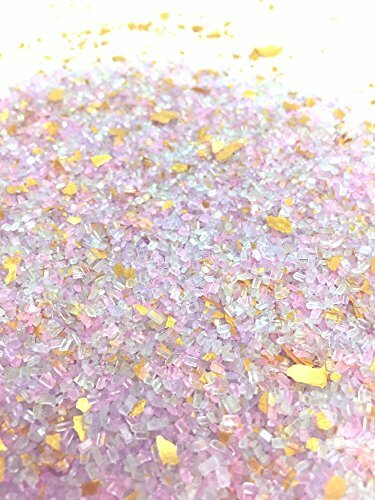 Shake off any excess chocolate and set onto the parchment paper, sprinkle with edible glitter and place a unicorn horn at the top. 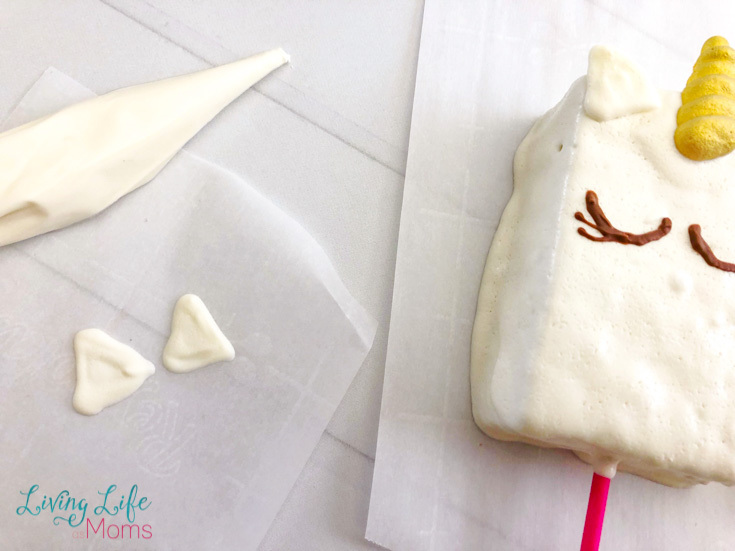 Pour the remaining white chocolate into a decorating bag and cut a tiny tip off the end and use it to draw small unicorn ears onto the parchment paper. Let your treats and ears harden at room temperature. 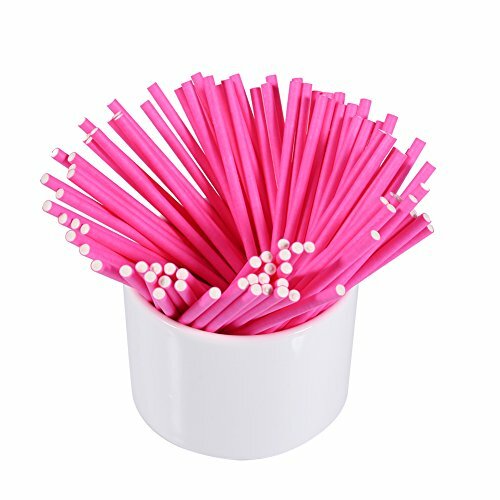 Heat your pink, blue and cocoa candy melts in separate microwave-safe bowls for 2-3 minutes on 50% power, stirring every 30 seconds until melted and pour each one into a separate decorating bag. 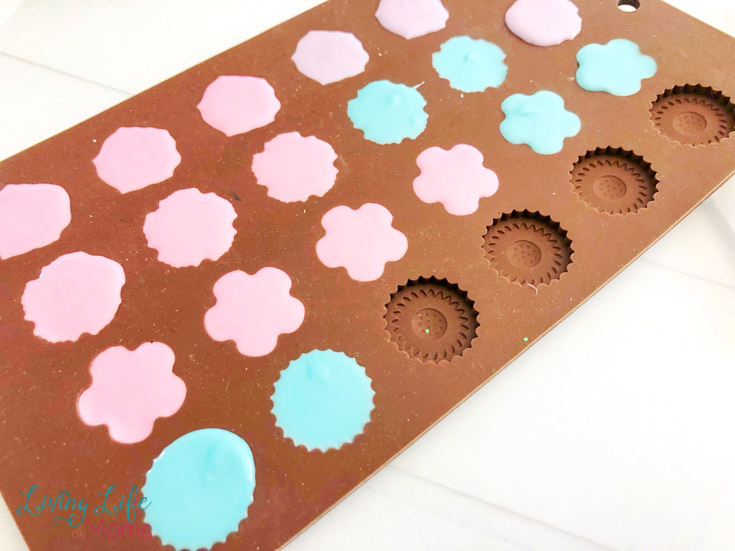 Fill each flower mold with either blue or pink melted chocolate and mix a little together to make a light purple and fill the rest with purple. Place in the freezer for 5 minutes. 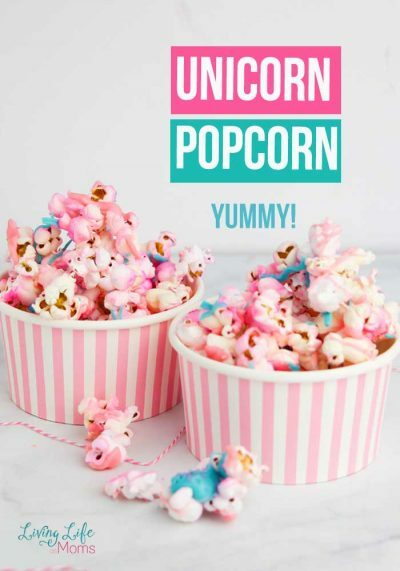 Stick the ears on each side of the unicorn horn with a little melted chocolate. Carefully remove the flowers and stick to the top of the Rice Krispies under the horn. Use the melted cocoa bag to draw eyelids under the flowers.